Q: Is 'Bolt' based on a book? Q: Who or what is "Bolt"? Q: Is this a Pixar film? Story-wise, there's nothing remarkably new about "Bolt," Walt Disney Animation's latest feature to hit the screens, but considering its patchy recent filmography, it's certainly a step to the right direction for the animation studio, now headed by Pixar-meister John Lasseter. While it's far below the sophisticated narratives and well-drawn characters of Pixar classics such as "Toy Story," "The Incredibles" and this year's "Wall-E," "Bolt" nevertheless charms its way to the screen with its eager-to-please lead character and diverting visuals. 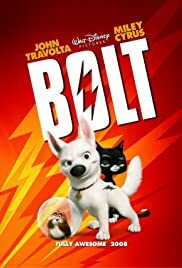 Bolt (voiced by John Travolta) is the canine star of a TV show where he plays a superdog whose lifelong mission is to protect his "person", Penny (Miley Cyrus), from the evil forces around them. 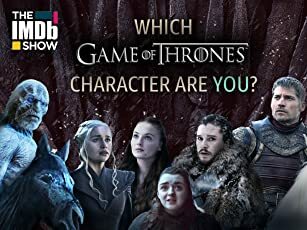 Problem is, as the creators of the show fervently believe that the show's success lies mainly in its realism, they have gone to great lengths to lead Bolt into believing everything is real and everything seems to be going well. That is until a studio mishap has Bolt improbably shipped across the country from Hollywood to New York. With the help of Mittens (Susie Essman), an alley cat who strangely knows more about dog ways than Bolt himself, and Bolt-fanatic hamster Rhino (Mark Walton), he goes on a long cross-country tripping to find his way back to Penny. Byron Howard and Chris Williams direct a calculated script by Williams and Dan Fogelman where nothing is terribly special, especially if you're not a dog-loving tween girl (I do love dogs, though), though it has enough sensitivity (that's Lasseter working) up its sleeve for some unashamedly touching moments. 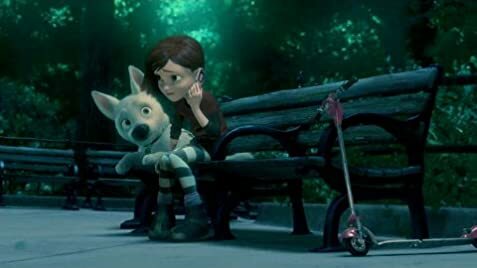 And with its cheery visuals, lively characters and a breezy pace, it also has enough going for the adults as well as the kids. It's safe harmless stuff.